Not a very good shot of my 10-year-old son, who is obviously super happy finishing his first 10k trail run race :-). I took this photo as he was running away from a girl during their water gun fight. I love how we can see the water line right above his head. Don’t you just hate it when you are standing at strategic spot by the finish line, camera is ready in hand, all set up, waiting for your subject to appear. Then as he enters, one random guy just innocently passes by right in front of you, blocking all your view. I just hate it! But I was pleasantly surprised when I uploaded my shots for that day, and it turned out that my subject was nicely framed by the arm of that dude. 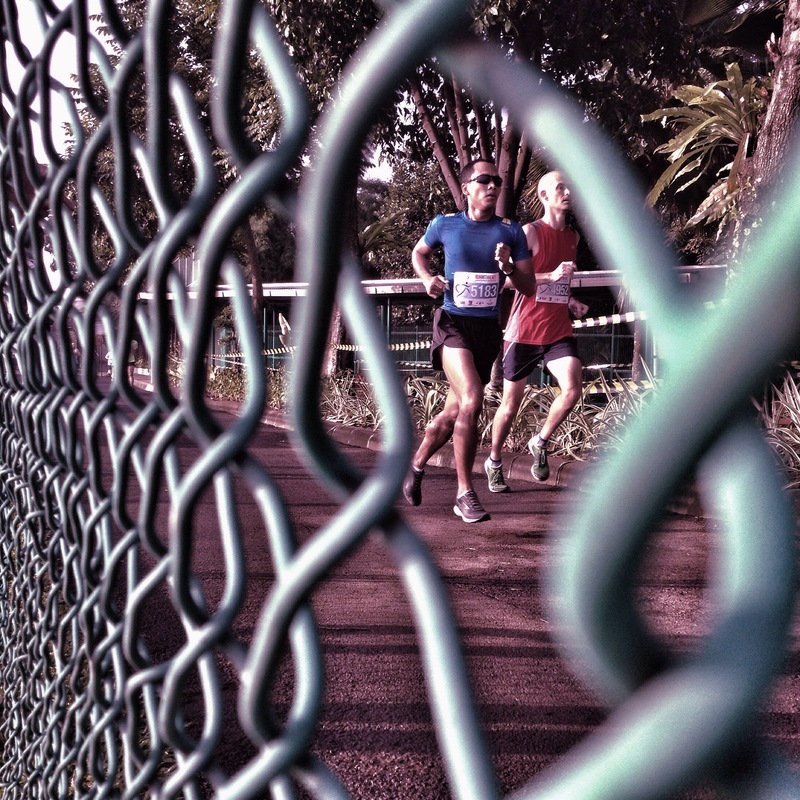 From the first leg of 5k Jakarta Race Series yesterday. I love this mist shower during run. I wish they have it along the route :-). This was shot during the Cold Storage Singapore Triathlon yesterday. It looks like as if these 3 gentlemen were choreographed to run behind one another. My favourite shot of the whole running leg. I managed to capture Ji Jeong Hwan from Korea (finishes 9th), in which his upper body looks perfectly clear and still, while his legs are levitating and blurry, showing the speed. I was sitting on the ground at the other side of the road trying to capture Dickson Tam from Hong Kong (finishes 10th), when at the same time a car passed by right in front of me, making the picture looking like as if he was head to head with it. Again, trying to capture that split second when the athletes are up in the air, above are from the elite women group : Yuka Sato from Japan (finishes 2nd), Hoi Long from Macau (finishes 7th) and Chen Wei Chien from Taipei (finishes 11th). I stood at the last corner towards the finish line, trying to capture that split second when both feet are up in the air, striking fast towards their personal victory. I learnt that it’s not that easy to take good pictures during off road triathlon. The course / track is so spread out, without any repeated loops, making it more difficult to get a ‘perfect’ spot. Here are just some pictures from the swim leg, which luckily (for me) is split into 2x750m with a short run in between. Apart from body language, concentration, determination, pushing oneself to achieve or even exceed one’s target are clearly seen in the facial expression of athletes, no matter which category or level they are. This is what I would like to record in these photographs.